Want to host a giant Thanksgiving dinner, but think it's hopeless because you live in a tiny apartment or other wee space? Never fear—you don't need the powers of Houdini to squeeze your guests around your breakfast nook, or that turkey and stuffing and pie into your overcrowded oven. 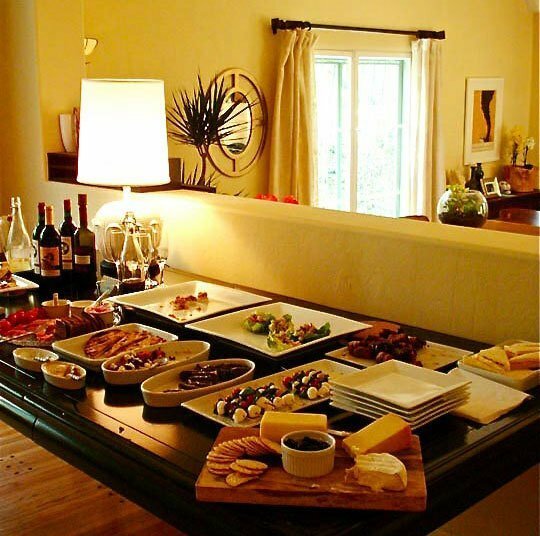 Hosting can happen in any-size home, if you know a few tricks to make the most of what you have. Here are some of the most common questions small-space hosts often have, plus some clever solutions. Where are you going to put all these people? "When you need to serve a large crowd in a small space, the first thing you need to do is let go of the idea of everyone sitting at one huge table," says Katie Moseman, a writer and recipe developer at Recipe for Perfection. "My recommendation is to get creative and set up as many small dining areas as you can. For example, in our house, we've used a small dining table, a bar area, and several free-standing cafe tables arranged in the living room and kitchen area." You could also toss a bunch of pillows onto the floor so people can eat anywhere, no chairs required, advises interior designer Katrina Stumbos. If you're not ready to give up on your vision of everybody gathered around a long table, borrow folding tables and card tables from friends. Line them up and cover them with tablecloths: Nobody will ever know what's underneath. As for chairs, "be OK with mixing and matching," says Stumbos. "Have some smaller chairs mixed with larger ones to ensure everyone fits around the table." If all of your friends are arriving by car, consider asking people to BYO chairs if possible. It's OK to make it a group effort! Where are you going to cook all that food? The solution: "Prepare side dishes and appetizers ahead of time to be reheated on the day of, and plan your cooking timeline carefully to make sure you have room for everything in the oven," suggests Melissa Riker of The Happier Homemaker blog. If you live in an apartment building or condo development, consider asking your neighbors traveling for Thanksgiving if you can borrow their ovens for the day (with the promise to clean up, of course). If you have outdoor space, you can free up the oven by doing the turkey in a fryer or smoking it on the grill. You could also toss the classic menu and cook something completely different. There's no law that says Thanksgiving has to involve turkey. If you have a signature meal you know you can pull off in your space, make that instead. Where are you going to set up your buffet? A buffet can go anywhere you have the space: on your kitchen counter, an island or peninsula, or even your emptied-out bookshelves. "Stack the serving platters on shelves," suggests Jeff Miller, a Realtor® in Baltimore. As for drinks? "Set up a station away from the kitchen for guests to serve their own drinks and reduce traffic through the food preparation areas," says Riker. What are you going to serve all that food on? Odds are, if you live in a small space, you don't have matching china service for 12 or 20. That's OK! Your first year hosting a big Thanksgiving might indeed involve some investment in extra china, serving dishes, and flatware—but you don't have to spend an arm and a leg. "Discount home decor stores like HomeGoods will have sets of flatware for $15, and often have fun seasonal, on-trend items," says Stumbos. Ikea also has stylish plates and glasses for as low as $1 per piece, as well as platters, casserole dishes, and other kitchen essentials at very low prices. Mix and match seasonal patterns with your everyday plates, she suggests. Another option from Riker: "Thrift stores can be a treasure trove of inexpensive dinnerware—mix and match for an eclectic feel." No storage space for extra stuff? If you're willing to spend the money, you can rent flatware, plates, glasses, and serving pieces. Another option is borrowing from friends and family (just make sure you remember who lent you what). There are also stylish disposable options for little more than the cost of standard paper plates. "Disposable wooden flatware can look more upscale than plastic but still fit even the smallest budgets," says Riker.